Walter Emerson Baum, well known as the critic for the "Philadelphia Bulletin" and for his landscape work, was born in Sellersville, Bucks County, Pennsylvania, in 1884. His entire life was spent in Sellersville, where he painted landscapes of the local countryside, and cityscapes depicting the antiquated architecture of his and other local towns. He received his initial training in 1904 from William Trego, a painter of military scenes. He entered the Pennsylvania Academy of the Fine Arts six years later, in 1910, and studied with Thomas Eakin's teacher, Thomas Anshutz. Daniel Garber, an influential member of the New Hope Landscape School, and member of the Academy's faculty, also influenced Baum's work and style. 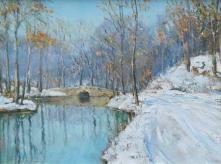 Baum often painted the area's seasonal changes working en plein air, occasionally painting snowstorms in the snowstorm itself. In the mid 1930's, he traveled to Europe, painting and visiting many museums. His trip was relatively short as he was eager to return home and resume painting the Delaware Valley's scenery. His works were completed in tempera, watercolor, oil, and pastels, numbering more than 2000. Although most of his paintings were landscapes, he completed many quaint cityscapes of nearby Allentown and Manayunk. In 1921, Baum began teaching art, and founded the Baum School in Allentown. For thirty years, ending in 1956, Baum worked as art editor and critic for the "Philadelphia Evening" and "Sunday Bulletin", writing more than 500 reviews. He died in 1956. Source: David Zellman, "300 Years of American Art"